This morning I attended the 2009 Chili Bowl at the University of Evansville...it's an annual event to raise money for the UE Clay Club. 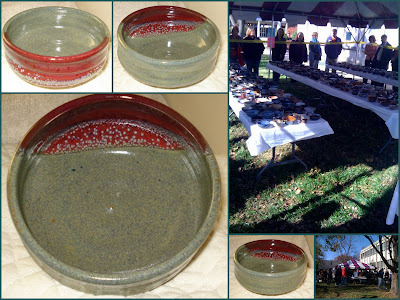 This year there were 540 bowls available. One of our bookshelvers at the library is in the Clay Club, and she's been busy making bowls. I met up with a co-worker around 10:30, and we scouted out the bowls we wanted---while we were behind a crime scene tape---and awaited the ribbon cutting at 11:00. After a mini tug-of-war with someone who had their sights set on the bowl I wanted, we all grabbed a styrofoam bowl and it was filled with chili. A piece of art and a bowl of chili...a bargain at $5.00 (student price).